At Cavalier, we use only the finest quality, ethically sourced diamonds, sapphires, and precious gemstones in our custom engagement and bridal designs. 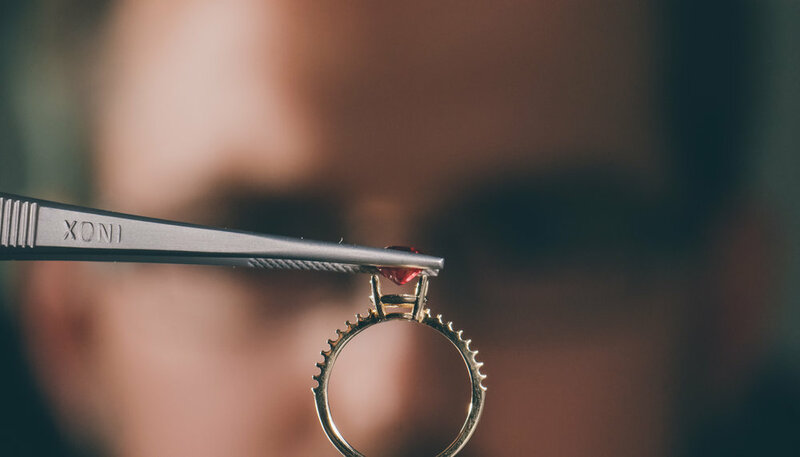 We invite you to sit down with us to hand select the perfect stone and begin building a custom design to suit the style of ring you're looking for. Using top of the line design and printing software, our in-house design and goldsmith experts are limited only by your imagination and will work with you to create something truly unique. Through 3D rendering and resin models, you will see the process step by step, allowing you to make any alterations prior to your approval of the final design. Once a design and stone has been selected, your ring is ready to be built. The resin model is cast into gold or platinum and the stones are then set. From design to completion, each custom piece takes approximately 4-8 weeks. If you require it sooner, please get in touch and we will try out best to accommodate rush orders.